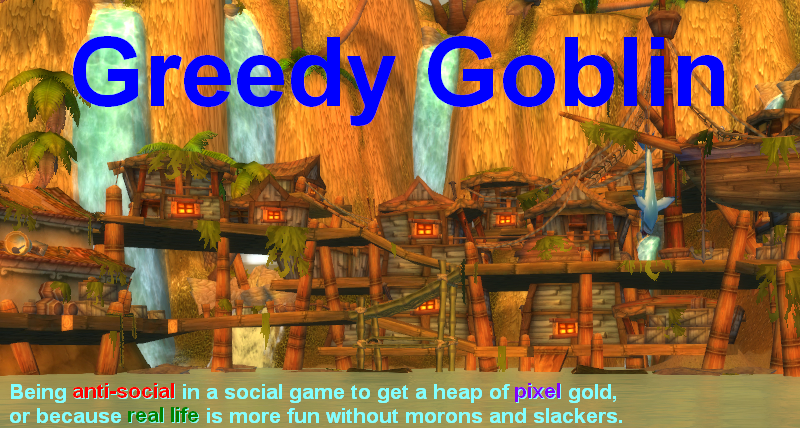 Greedy goblin: BDO business: vendor it! Remember the picture from yesterday? 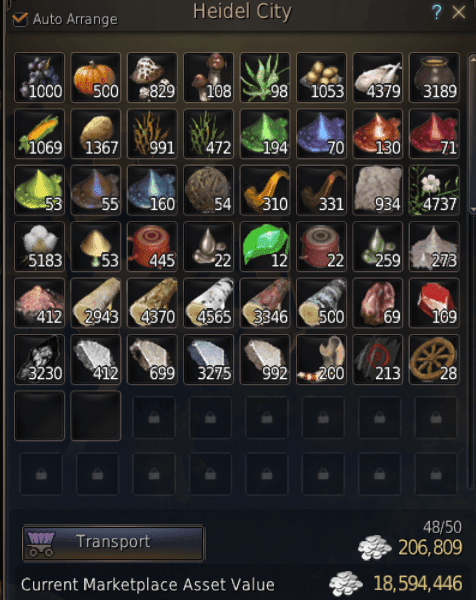 After I was pleased how well I filled the Heidel storehouse, I listed the possible 30 wares and went to sleep. In the morning I've found about 10 sold, 20 didn't. That's not a problem for someone believing in deep undercutting, I take them out and relist them lower until they sell. Except, I couldn't, since BDO sets price ranges and these items were already at the minimum, along with hundreds of others. It was obvious that they'll have to wait a lot before they sell (I guess equal value orders are sorted by age). Please note that if the item(s) are in large quantity and don't fit into one cart, you have to visit the same town multiple times in the first case, while in the second, you simply make more walks between storage and vendor. Saving that effort is really worth selling for 10-15% cheaper. What strikes me as really weird in this game is, in direct opposition to the hyper complexity and pseudo-realism of many of the mechanics... you have only "silver coins" as a currency. Millions and millions of silver coins. Even if these coins were the size of a Drachma or a Denarius from back in the day (84 to 96 coins per pound. Let's round up to 100 coins per pound.) which would be a tiny coin smaller than a US dime... a million of these would weigh 10,000 pounds. Even a thousand of these would be a whopping 10 pound bag of silver. Something you may have overlooked: you can list to Marketplace directly from storage. That might not change your decision on what is and isn't worth listing, but it's worth knowing regardless. I really appreciate what you're doing here, Gevlon. Although I'm no trader by any stretch of the imagination, the information is useful and well-presented, helping to broaden my knowledge of the game. At the moment, I don't have time to go through all the guides, so I need to find one which is reliable and readable. I'll stick with you, because I know your pedigree! Oh, I get that they have "weight" and they should be kept in your warehouse. But it's still ridiculous. The vendor starts... one, two, three... He IS counting individual, microscopic silver coins. It's a ridiculous concept. If you're going to go for realism, do it. Design a currency system that makes sense. Partial measures like this are fail. @Anon: really? That's a great feature and will check it out! It's better melting ("L" -> Heating) weapons/armor than vendoring them, you can also do it on the go. Especially Knots (zerker offhand) and Talismans have fair chance of melting into Pure Crystal. Vendoring raw mats is hardly a good way to make money - process them. Birch Planks/Plywood sells quite a lot and any plank/plywood needed for Calpheon Timber Crate as well. Vendoring mats? That's... something I'd not thought to do. I keep looking at my listed Asset Value and thinking 'that value is so fake, I'll never be able to sell all those mats' - but vendoring the ones that don't sell? That's a really good idea. Finally, that mountain of unsellable Ash timber has a use! Other ways to tell what will and won't sell: that green scroll icon underneath the 'Max' in your screenshot is Total Lifetime Sales of that item; the blue bag icon above the 'Min' in your screenshot is Total Current Listings for that item - it's easy to check if there is demand for the item you're listing, and how big the competing supply is - and as you can see, Seleth weapons and gear simply don't sell. 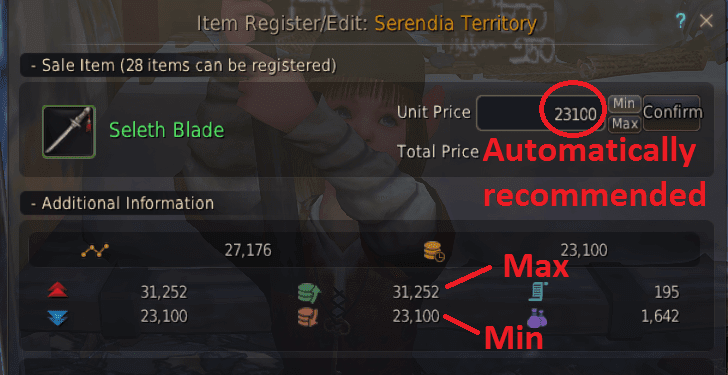 Also: when you open a given tab in the Marketplace, the default sorting is Total Lifetime Sales - so if you're trying to sell something and it's not on page 1 of the Marketplace, it had better be a high-value item. One suggestion with the Seleth gear (and other, similar gear): when melted down, weapons and armour have a chance of returning Pure X Cystals (Seleth can give Pure Lead Crystals, for example), which always sell for north of 100k. Whether it's worth the gample of destryong the gear and losing the vendors 10-15k sale price for a possible Crystal 10x as valuable is a value judgement - if I'm on an alt with high Processing, I melt; if not I sell. 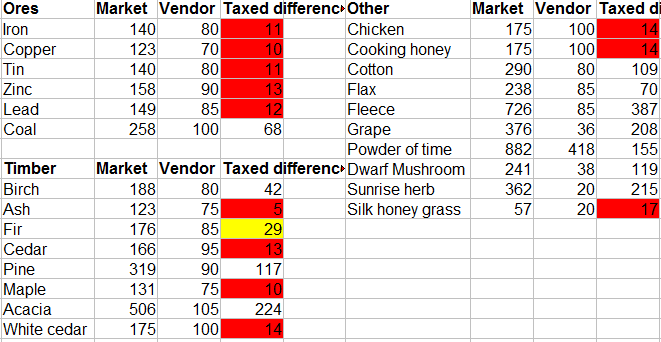 When you gather items these item have an origin and if you sell them at a vendor far away you will sell at much higher. I've learned that from a video... I don't find it now but I will try to. @Gevlon - yep, in towns that have a marketplace, there is a "Marketplace" button on the Warehouse UI. Click that, and you can list from there. You still have to go to the merchant to buy, and to collect payments, however. @Smokeman: I'd assume the shopkeeper would just use scales to give you the correct amount of coins. @Vincent you are confusing trade items (which you can get as rare proc during gathering, eg. insect in ember, crystallized blood, etc.) and raw mats (these have no origin or anything). @Destabilizator: good idea on melting armor. I did not vendor Birch, I sold them. Processing obviously increases the value of the material, but cost either energy points or contribution points (workshop + lodging for the worker). @Anon: post updated for that feature. @Destabilizator: I focused on cooking with my energy, so I can't also do processing at large.